As a sequel to our webinar, "Breaking Through Your Data Bottleneck With Agile ETL", we’ll be exploring a case study with our customer Fairpoint Communications. Lavastorm CTO, Mark Marinelli, will be interviewing Kerry Reitnauer, Director of Solutions Architecture, at FairPoint on the challenges faced while making the transition from traditional ETL processes to Lavastorm Agile ETL. 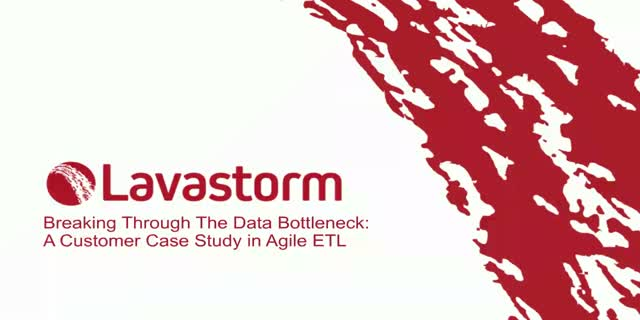 In this interview, they’ll discuss how Fairpoint came to the conclusion that the waterfall approach to ETL was inefficient, and how they adjusted their mindset to adopt an agile approach. They’ll specifically address how this approach accelerated projects without compromising governance, quality and accuracy. If your data science team is stuck on a never-ending hamster wheel of ineffective training and business requests, or if you are now building an analytics center of excellence (CoE) then it is time to reexamine the prevailing wisdom. Amidst the gold rush to become a ‘data-driven’ organization, companies are rapidly setting up analytics centers of excellence. But they are doing so in a way that unwittingly prioritizes software training and procurement over tackling broader organizational challenges. To address this concern, Blue Hill Research conducted a study of top consultancies, systems integrators, and Fortune-100 companies to understand how organizations should construct analytics CoEs to retain top talent, proactively take charge of complex challenges, and lead transformative change. Join Blue Hill Research’s Principal Analyst James Haight and Lavastorm CTO Mark Marinelli as they discuss Blue Hill’s dedicated research into the mindset, strategies, and techniques needed to build successful analytics centers of excellence. Is your access to data via ETL channels creating a bottleneck in your business? Traditional ETL tools are exceedingly good at moving large quantities of data from one place to another repeatedly, reliably, and efficiently. For a large class of problems, where time-to-value is critical and applications need to be flexible as business requirements change, these ETL tools and waterfall projects are not a viable solution. Alternative technologies are now available which marry self-service data preparation with enterprise data management capabilities to accelerate value delivery and accommodate change, without reducing the scale, scope, and rigor of data analysis. Combined with new skills and new ways of thinking about data discovery, these new tools power a new agile process which yields more accurate results more quickly, moving beyond the traditional ETL bottleneck to an environment of continuous value delivery. Tableau’s stunning success has empowered individuals across the enterprise to create powerful data visualization and analysis on-demand. However, the challenge lies in the time and effort it takes to prep data for visualization. According to James Haight of Blue Hill Research, on average data analysts spend between 50 to 60% of their time just preparing the data. In today’s data-driven environment, organizations can’t afford insight bottlenecks when it comes to getting the answers they need. – explore new methods of analyzing data that can lead to cutting-edge decision making. •Make informed decisions faster by empowering data architects and non-technical business analysts to visually communicate data flows and business logic. •Improve transparency by removing the "Black Box" and provide actionable, accurate insights that all parties involved can trust. •Ensure governance and data quality through self-service data provisioning and embedded business rules and data sourcing. •Enable anyone to quickly visualize and securely share analysis through cloud-based dashboards.